Police are seen near a damaged van in Toronto on April 23, 2018. 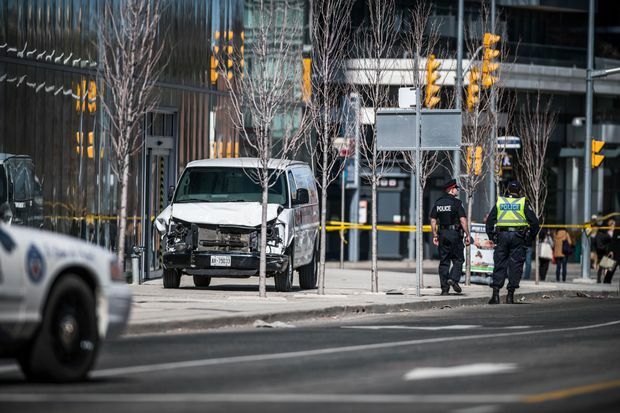 Monday’s deadly rental van rampage in Toronto shows how quickly a vehicle can be turned into a weapon, but rental agencies are finding few clear options to prevent their property from involvement in such violent acts. “Members aren’t experts at profiling customers,” said Poston. The British association is, however, looking to better co-ordinate with law and security officials to make it easier to share data. Poston said rental agencies wouldn’t have access to terror watchlists or the like, but could potentially feed information to authorities for better monitoring. Member companies are also looking to potentially institute other record searches like credit and criminal background checks, but even then there is no clear way to determine that a vehicle shouldn’t be rented, said Poston. The accused in the Toronto van attack, Alek Minassian, did not even raise any red flags during a brief stint in the Canadian Armed Forces last year, a military source told The Canadian Press. Toronto police said he rented the van from a Ryder rental location north of the city. The company said Tuesday it was fully co-operating with authorities, but declined to comment on its current security policies. The Associated Canadian Car Rental Operators said government officials have yet to reach out to try to co-ordinate data sharing. But any such efforts would be complicated, said vice president of government relations Craig Hirota. The RCMP’s National Critical Infrastructure Team has been in contact with industry and sends out relevant information, Hirota added. He said the rental industry has long been concerned with fraudulent and criminal activity with rentals, but there are limited options for screenings. The U.K. rental association is looking to security models elsewhere, including the New York Police Department’s Operation Nexus program that facilitates reporting of suspicious business encounters. It is also considering the establishment of a national accreditation scheme that could include training and formalizing policies such as no cash rentals. Companies also generally require business accounts for customers wanting to rent larger trucks, said Poston. Elsewhere in Europe, Italy has implemented a real-time notification scheme with rental operators and a similar one is being developed in Belgium. Sweden is looking to introduce geofence technology that could connect with a vehicle’s on-board computer and limit its speed to a safe level. The ease of carrying out such attacks, and the difficulties in detecting them are part of the reason for their rise, said Jeremy Littlewood, an assistant professor at Carleton University’s Norman Paterson School of International Affairs. “It’s easy to replicate if someone gets that into their head,” said Littlewood. Littlewood also questioned the effectiveness of background checks. He pointed out that Alek Minassian, now charged with 10 counts of first-degree murder for Monday’s attack, was not known to police. Even when perpetrators are known it is still difficult to stop an attack, said Littlewood, noting that Martin Couture-Rouleau was reported to be under RCMP surveillance when in 2014 he used a vehicle in Saint-Jean-sur-Richelieu, Que., to hit two members of the Canadian Armed Forces, leaving one dead. Prevention has instead focused on more cement barriers, and heavy trucks at intersections for major events, but there’s no way to fully prevent this sort of attack entirely, said Littlewood.